Malaysia is one of the most diverse countries in South East Asia, a true melting pot of Malay, Chinese, Indian and western cultures, but amongst this diversity, the city of Malacca stands out above the rest with its unique display of heritage, formed over hundreds of years through different influences from across the world. 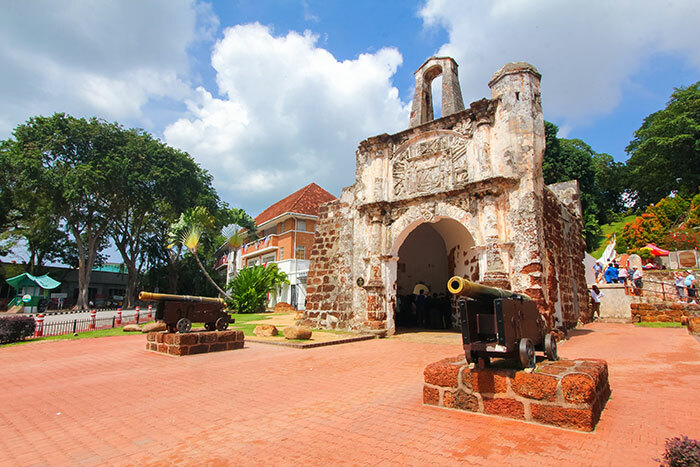 In many ways, Malacca is a microcosm of the entire country, and because the city was colonised by the Portuguese, then the Dutch and finally by the British, you can find ruins and legacies left by all three colonial powers. Europeans aside, Malacca has long been an important trading power on the coast, and the city attracted settlers from China and India, alongside Malay and Islamic influences too. It’s a vibrant, colourful city to explore, with a UNESCO World Heritage-listed old town, old Portuguese forts and churches, and some of the best food in Malaysia, which in a country with such a culinary reputation as this, is a bold claim, but one that you’ll quickly realise could well be true. Here’s our guide to exploring Malacca, from the best sights to see, to the best dishes to eat. Jonker Walk is the most famous street in Malacca, and a quick stroll along this heritage listed avenue in the centre of Chinatown will have you immersed in the Chinese-Malay history while you gorge on endless street food. You’ll find old Chinese style houses, temples and shopfronts, some dating back several hundred years to the Dutch, or even the Portuguese eras. If you love food, there’s plenty here to sate your appetite, while you’ll also find many great art galleries and museums along the street. If you can visit on the weekend, then every Friday, Saturday and Sunday evening Jonker Walk is closed to vehicles and the best food vendors in Malacca start cooking up a feast at the night market. Jonker Walk is just one part of the UNESCO World Heritage listed old town of Malacca, and you’ll want to make sure that you get off the busy main street to explore the rest of the historic city. Malacca was recognised by UNESCO because of its sheer diversity, and you’ll find everything from Christian churches and Chinese buddhas to mosques and Hindu temples nestled amongst the historic buildings. Cycle rickshaws won’t be anything new if you’ve spent time anywhere else in Southeast Asia, as you can find this unique mode of transport across the region, but in Malacca, they’ve taken the simple concept to new, dizzying heights. Racing across the city you’ll see brightly coloured rickshaws being pedalled furiously by locals as they blare out pop and techno music from huge speakers. Each cycle rickshaw has its own individual and always colourful design, and many are bizarrely decorated with bright Pokemon characters or with depictions of the infamous Hello Kitty. At night, the rickshaws turn on their strobe lights, and they are lit up by flashing, neon colours. Take a ride to see the city for cheap, and to enjoy a very Malaccan travel experience. The city is built on the banks of the Malacca River, which empties out into the great strait on the coast. This location was one of the main reasons that Malacca was so coveted by competing colonial powers through its history, as its prime position gave it the opportunity to be a trading hub for Southeast Asia. 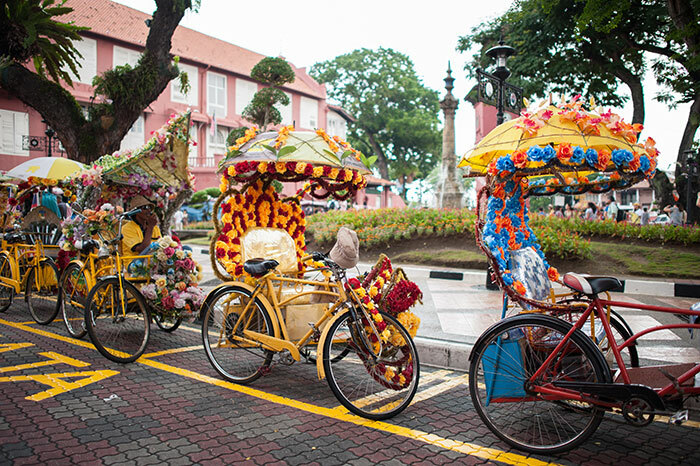 In the centre of Malacca, pleasant promenades run along either side of the river, and you can stroll along the walkways to enjoy the fresh air and to escape the surrounding city. Some of the best restaurants and bars in Malacca are found on the river too, so stop off for local eats or to watch the sunset with a cold drink in hand. The Portuguese conquered Malacca by force in 1511, as they wanted to dominate the lucrative trade routes in Southeast Asia. They ruled the city for 130 years until the Dutch arrived in 1641 and conquered Malacca from the Portuguese. Today, you can still find many remnants from the Portuguese era, as what they built formed much of the basis of the modern city. On the hill overlooking the centre of the city, you can find the crumbling remains of St Paul’s Church, and although the church long ago lost its roof, it still stands in a domineering location above Malacca. At the base of the hill, you can find the ruins of the Portuguese fort, A Famosa, which was destroyed by the British in the 19th century. All that’s left today is a solitary gateway and a few ancient cannon. 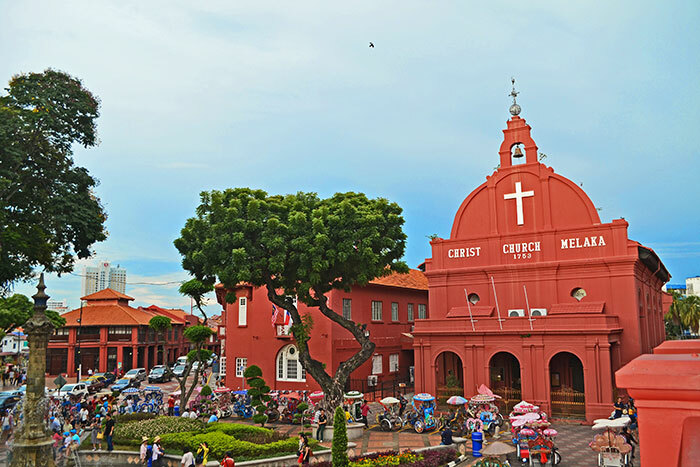 The Dutch also left their mark on the city too and you’ll find impressive Dutch built churches around Malacca, including the red walls of Christ Church in the city centre. 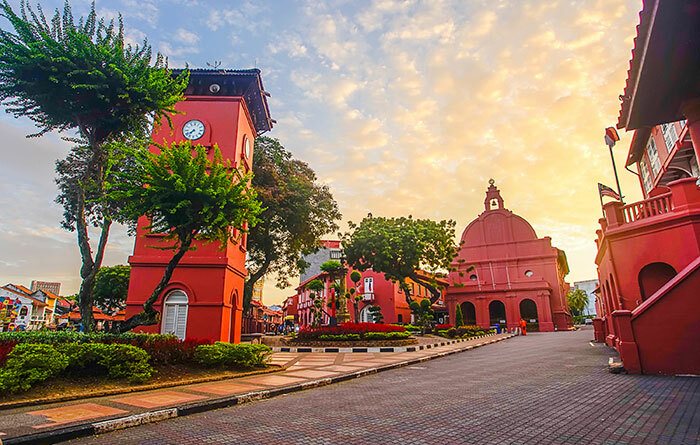 This was the heart of Dutch Malacca for almost two centuries, and on the same street, you can find the impressive and well preserved Stadthuys, the town hall, alongside a Dutch-built clocktower. Inside the old Dutch Stadthuys, you can find one of the best museums in Malacca. The History and Ethnography Museum will give you a detailed rundown of the city’s history, from the first Malay settlers, right through to independence. One of the most intriguing sub-cultures that’s found in Malacca, is that of the Baba Nyonya people. 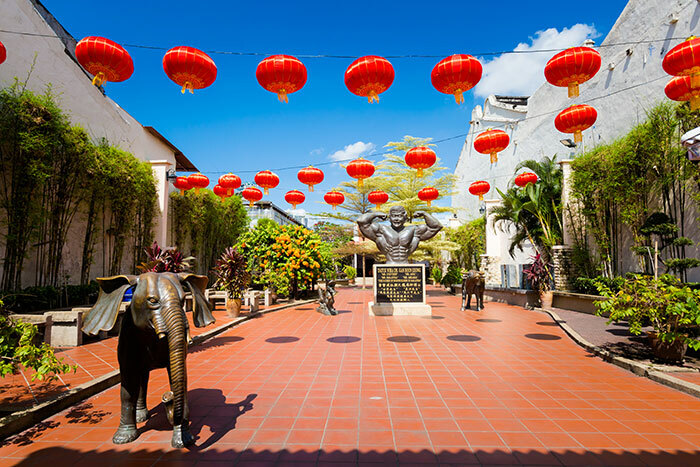 Located in an authentic, 19th-century Chinese house in the historic heart of Malacca, the Baba Nyonya Heritage Museum offers an insight into the curious local culture that formed when Chinese immigrants arrived and began to mix with the local Malays. You can learn about their unique dialects, food and religion at the museum, as well as learning about how the Baba Nyonya have played an important role in the development of multicultural Malacca as you see it today. On the outskirts of the city, you can find the awe-inducing sight of Malacca’s floating mosque. The Malacca Straits Mosque, as it’s officially known, is built on a small island off the coast, and its watery location gives every impression that it is in fact, floating. It’s an impressive structure, with a tall minaret and huge dome built in a distinctly Malay style. This is a great spot to catch the sunset over the Strait of Malacca, while at night, the mosque is vibrantly illuminated by colourful lights. Every city in Malaysia will claim to be the culinary capital of the nation, but Malacca truly deserves that accolade. With its multicultural makeup, you can find almost any style of cuisine being cooked up somewhere in the city, and it’s almost always guaranteed to be delicious. The best places to eat are the street food stalls, night markets and little local restaurants, and you could easily spend weeks in Malacca eating a different dish every single day. 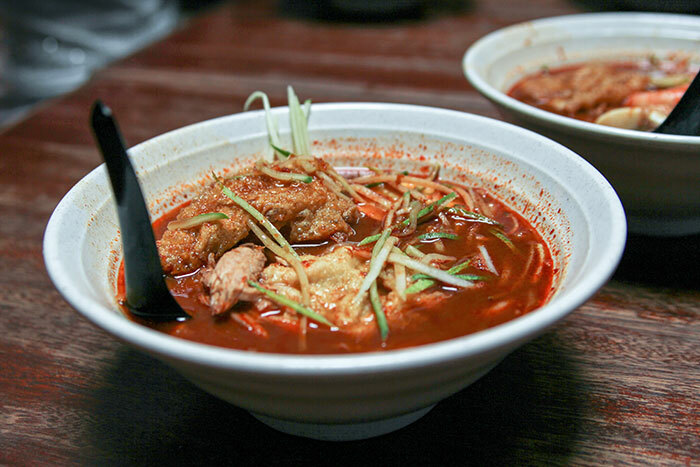 Start your visit with a steaming bowl of Nyonya Laksa, the spicy local variety of the Malay favourite, Laksa, before delving into the huge variety of cuisine on offer. You can order chicken tandoori and naan bread with all manner of curry sauces to accompany in the Indian restaurants, while you can even find a few Portuguese eateries, serving up the classic Portuguese-Malay dish known as Devil’s Curry, a fiery, chilli filled broth that will set your taste buds aflame. 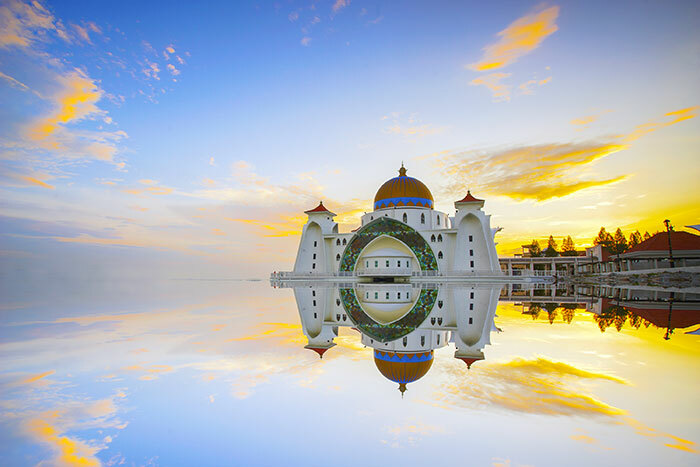 Head to Malacca on one of Flight Centre's Malaysia holidays.